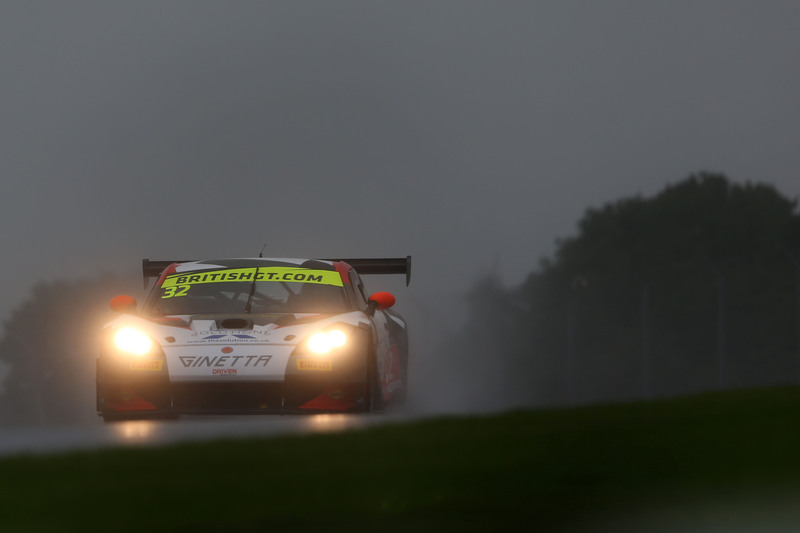 Cool, wet conditions greeted the drivers as cars took to the track for the first practice session for the final round of the 2016 British GT Championship at Donington Park. Conditions were such that few teams were prepared to push hard and risk damage early in the weekend. The forecast is for the rain to clear by the early afternoon so, with FP2 set for 12:20, times in a dryer second session will probably be more indicative of overall pace. Despite the poor conditions, few drivers made off-track excursions. The #72 Stratton Motorsport Lotus Evora GT4 with Gavan Kershaw at the wheel spun early in the session and a trip into the gravel by Abbie Eaton in the #60 Ebor GT Motorsport Maserati GT MC GT4 briefly red-flagged the session after 22 minutes. No damage was incurred by the #60 car. Mike Simpson in the #32 Tolman Motorsport Ginetta G55 GT3 set the quickest time of the session with a 1:44.599. 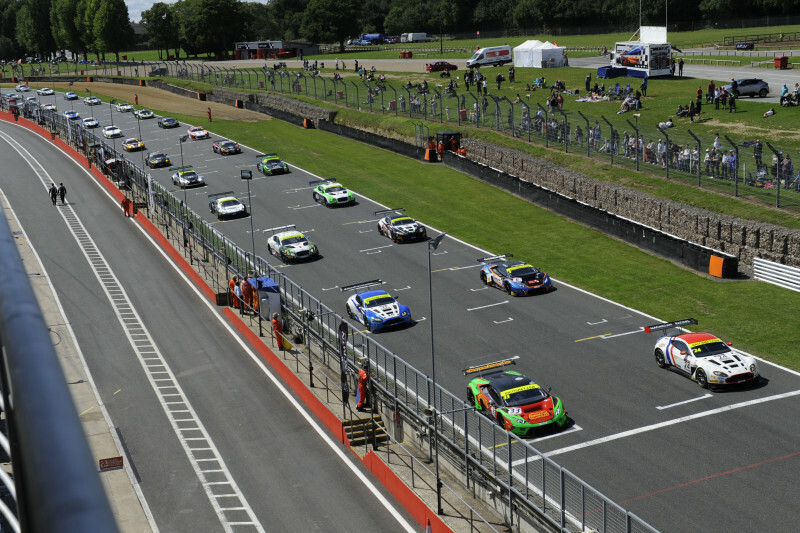 Second quickest in GT3 was the ##33 Barwell Motorsport Lamborghini Huracán GT3 with a time of 1:45.636 being set by Phil Keen. 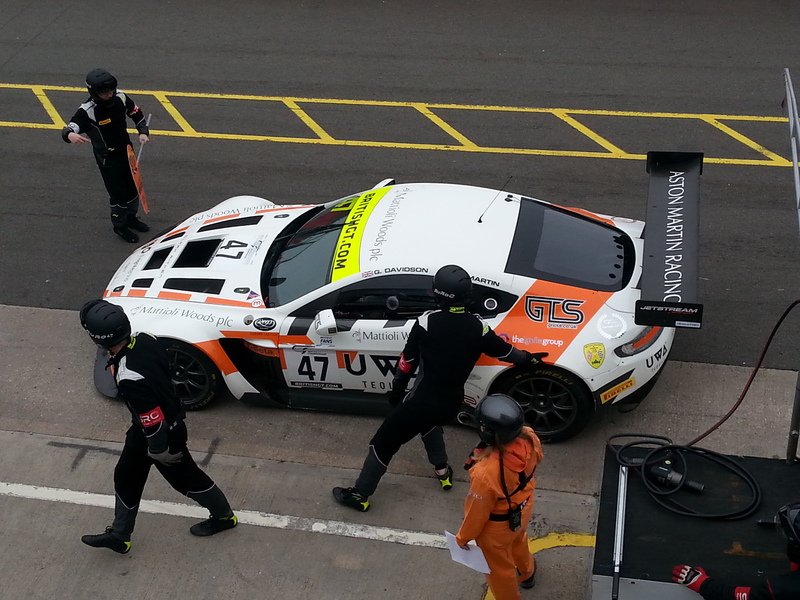 Third quickest in GT3 was the #8 Motorbase Performance Aston Martin GT3 driven by Ross Wylie. In GT4, it was the #73 Century Motorsport Ginetta G55 GT4 driven by Nathan Freke that set the quickest time with a 1:51.324. Ross Gunn, in his second outing in the #407 Beechdean AMR Aston Martin Vantage GT4, was second quickest with a 1:51.434. Third quickest in GT4 was the #42 Generation AMR MacMillan Racing Aston Martin Vantage GT4 with a time of 1:51.688 set by Matthew Graham. A 50-minute FP2 session is scheduled for 12:20 with qualifying starting at 16:15. Qualifying will follow the usual format of 10-minute sessions for each of the four classes of drivers, beginning with GT3 Am.